Townhouse in La Orotava Tenerife. La Orotava is big. In the past, Puerto de la Cruz was the fishing port for this great town on Tenerife Island. Looking back I call everything I am remembering in this page my Orotava adventure. Would you have that in a normal holiday in Tenerife? 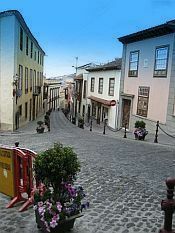 Climbing a steep cobblestone street in La Orotava makes you feel like you've gone back in time which also reminds me Garachico where we went for shopping. You almost see yourself inside a romantic Spitzweg painting. I can't resist mentioning that I saw a similar building like our Orotava oldie in San Juan de la Rambla by the old church, much later. That one was a touch gloomy, however, and much older. It was in a building dating back to the 17th century where the woodworm dust was almost drizzling down from enormous, wooden ceiling beams. Our oldie townhouse of Orotava ,however, was bright and friendly. Our townhouse had amazing inside balconies. However, you very often get even more spectacular Tenerife outside balconies that are striking architectural details, such as this one in the picture below in the north of the island. Why an old townhouse in la Orotava Tenerife? Let me get to the point telling you about one of townhouses in La Orotava that was for sale. apartments, villas and penthouses in Tenerife. Of course, the townhouse in La Orotava Tenerife that expected us was a bit more than mature. good pictures of which you can also see in the towns' famous event of Corpus Christie which is also the day of famous flower carpet shows. was opened for us. Krrr... it went. The hinges needed oiling. An earthen pot with a large, green, fern standing in some corner. Canary pine stairways leading upstairs to bedrooms in the townhouse in La Orotava Tenerife. We climbed them. Our friends went first. "They creak", I whisper to my husband. "Shsh", he goes. "Woodworm", I say. "Shut up", he goes. "Timber wax, good smell" "Shsh! Our lady friend was wise to leave her high heeled shoes at home. They would not have been perfect for the townhouse in la Orotava Tenerife. They might have gotten stuck in between the cobbles of some Orotava streets. They might not have been ideal for the old wooden steps either. Of course, you will find similar patios, while the most alluring is certainly at the romantic hotel Quinta Roja of Garachico. Did you know that organized tours take you to Tenerife landmarks like the Casa de los Balcones in La Orotava which is one of the jewels of Tenerife culture? ocean with its wild and virgin Orotava beaches below awesome rocky walls which remind miniature replicas of Los Gigantes..
"Oh, look a garden, our garden in our townhouse in La Orotava Tenerife!" My husband would have said: "Perhaps, a bit of a problem!" But, he kept silent. When asked, he replied that one could make a plan. Our oldie townhouse was great. A circular stone archway was leading around the patio fenced off kitchen, living-rooms and bath rooms. One could see many small windows. Here, the kind of Tenerife skylight our friends had in mind. It would have been so perfect for the townhouse in La Orotava Tenerife as a patio top. Should they really buy it as a holiday home? In fact, the old house was not bad at all. The town house in La Orotava Tenerife had potential to become a very original holiday home in Tenerife, indeed. The Orotava oldie was charming like only an old lady may be. 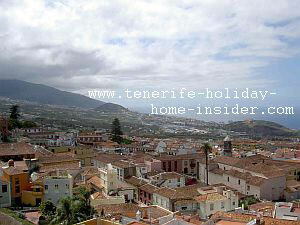 Never had our friends dreamed of an oldie townhouse in La Orotava Tenerife. Not as a holiday home, anyway... But, now, they had fallen in love with this gracious, old, lady-like-townhouse. Be happy against all odds? Why worry about her wrinkles and her aches in her staircase? Sonia and Richard firmly believed that they could be helped. A total face lift would rejuvenate the old beauty townhouse in la Orotava Tenerife. Her rooms would get robed with oak built-in cupboards. The future kitchen would get revamped with new furniture, gadgets and appliances, fit for the best of kitchens in Tenerife. The heart of the townhouse in La Orotava Tenerife, the patio in the center, would get a glass-like roof top to protect against weather and sun. 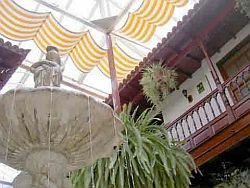 A marble fountain would be placed into the patio of the townhouse in La Orotava. Canvas, cane and some of the famous, pretty Tenerife cotton lace would be used. Where? In the shop that caters for the newly wed. The shop in the Casa Lercaro in La Orotava. It was in walking distance from our more modest oldie. Our townhouse in La Orotava, Tenerife could, of course not measure up with a house like Casa Lercaro. 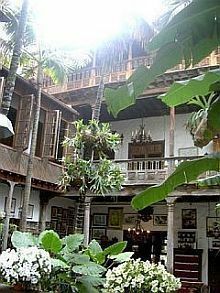 Casa Lercaro is one of most beautiful and oldest buildings of Tenerife. 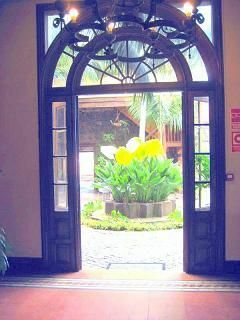 in a townhouse in la Orotava Tenerife. Turn right and take a seat in one of most stunning patios. Indeed, discover, why this is one of best insider places for eating out at any time in Tenerife. of the year. See most stunning Christmas pictures of the old quarters of La Orotava. They include Casa Lercaro and speak for themselves, absolutely. Tenerife and all our ideas! ", exclaimed Sonia, last not least. "Everybody from our family must come over for Christmas. To our new townhouse in la Orotava Tenerife..." She meant the Canary part of her family. The holiday home hunt had definitely come to an end for her. Many a holiday on the biggest Canary island was guarantied for her future. Oh, and you know, what Richard was so thrilled about? He had discovered vines growing over a trail at the end of the slightly overgrown garden. Vines were also by the one side of the walled-in townhouse in La Orotava Tenerife property. Later, Richard made friends with a neighbor who was a wine grower himself. La Orotava wines are among the best in Tenerife. Richard would be happy, very happy in his renovated holiday home in Tenerife townhouse in la Orotava Tenerife..
Of course, there were some "little things" to be dealt with. The townhouse in la Orotava Tenerife needed some repairs. Some new installations and may be even a change of paint here and there were necessary. Of course, they would never think of flipping their property nor would they ever consider Tenerife selling of their precious home to be. They were serious about living on Tenerife Island once retired. Final documents had to be signed, taxes had to be paid and more had to be done for the townhouse in la Orotava Tenerife. No mortgage which would have taken up extra time to apply for was needed. With a big smile, of course... We were all happy. "I told you, there wouldn't be a problem", was all my husband said. He was right as usual. It was a clean deal, as well. It had no property strings attached and would would work out an excellent investment to be. 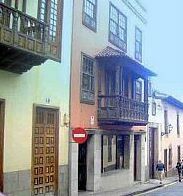 Taking into consideration that it's rare to find an Orotava townhouse, here is one in a village, though. It has 9 bedrooms and it costs about €250000 which is a give away depending on the infrastructure of the property. If interested call the agent whom I don't know by the way.